Jesus Christ. Alpha and Omega: What language did Jesus speak? The pope and Israel’s prime minister disagree. What language did Jesus speak? The pope and Israel’s prime minister disagree. Pope Francis carried out a headline-grabbing three-day tour of the Holy Land, visiting refugees, hugging clerics and honoring the victims of the Holocaust. But perhaps the most interesting moment of the trip came during an exchange with Israeli Prime Minister Benjamin Netanyahu at a meeting in Jerusalem. The Israeli premier and the pope found occasion for a slight historical quibble. "Jesus was here, in this land. He spoke Hebrew," Netanyahu told the pope, through an interpreter. "Aramaic," the pontiff immediately corrected. "He spoke Aramaic, but he knew Hebrew," offered Netanyahu. "Jesus was here, in this land. He spoke Hebrew," Netanyahu told the pope, through an interpreter. "Aramaic," the pontiff immediately corrected. "He spoke Aramaic, but he knew Hebrew," offered Netanyahu. You can watch the full exchange below (it takes place around the one minute-mark). Netanyahu is addressing the Spanish-speaking, Argentine pope in Hebrew, which is translated by the interpreter into Italian. 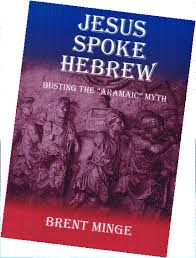 Pastor Minge draws upon various sources (Dead Sea Scrolls, Talmud, Josephus, Targums) to demonstrate his thesis that Hebrew, not Aramaic, was the language spoken in Palestine at the time of Jesus. Jesus, too, spoke Hebrew with a Galilean accent. Let us look at a couple of examples of this relevant to the Passion/ Resurrection season. “… Eloi, Eloi (“My God, My God”, Mark 15:34) is clearly related to the Hebrew word used at time for “my God” in the Psalms (cf. “my God”, Ps. 18:28; 139:19, “My God”, Mk. 15:34). Astonishingly – given that Eloi, Eloi has always been cited as proof of the Aramaic source of the words – we find that the Targum of Psalm 22:1(2) does not begin with “Eloi, Eloi” but “Eli, Eli”, as in the Hebrew. In two ways “Eloi, Eloi” is different from the Aramaic – with “oi, oi” instead of “I, I” and the short “E, E” instead of the long “Ay, Ay” (as in “day”). (b) they rightly understood the rest of the cry as representing Jesus’ deep desolation (“Let us see if Elijah will come and rescue him”), though obviously yet blind to the fact that here, in the very week of the Passover, the Lamb of God was bearing the sins of the world. Given that the cry was uttered “in a loud voice”, there is no possibility of it having been misunderstood on the grounds of its being inaudible. The only explanation, therefore, that adequately addresses both questions (how could they have misunderstood Jesus, yet perfectly understood the rest of the utterance from the Hebrew Bible? ), lies in the fact that they (ie. the Jewish portion of the crowd) and he (ie. Jesus) were speaking the same Hebrew language. But he with a Galilean accent. …”. “Rabbi and Rabboni – the latter, Mary [Magdalene’]s spontaneous greeting to the risen Jesus (John 20:16) – were also held to be Aramaic. Yet they appear in the Targums only as “rebbi”, “ribbi” and “ribboni”. Rabbi, on the other hand, is a classical Hebrew word, while Rabboni is now acknowledged as a “Hebrew …title that took on the meaning ‘My Master’.” ….